Stun your guests by serving them sparkling water from this new glass retro-styled 1L soda syphon. This soda syphon would be perfect for themed bars or as an elegant addition to a variety of contemporary counter tops. Just add water and charge with a CO2 cartridge. 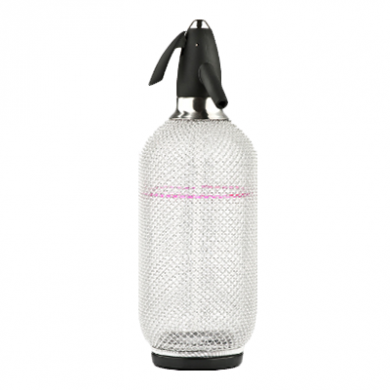 The syphon is has a thick glass body - surrounded by an attractive stainless steel chainmail to protect it! It has a rubber base which protects the bottom of the syphon and also helps to keep the syphon from sliding off a bar or polished surface. Use with any brand of soda CO2 cartridges. Make fresh soda water with ease. Use ice cold water for the best carbonation. Stylish glass body with steel mesh surround.